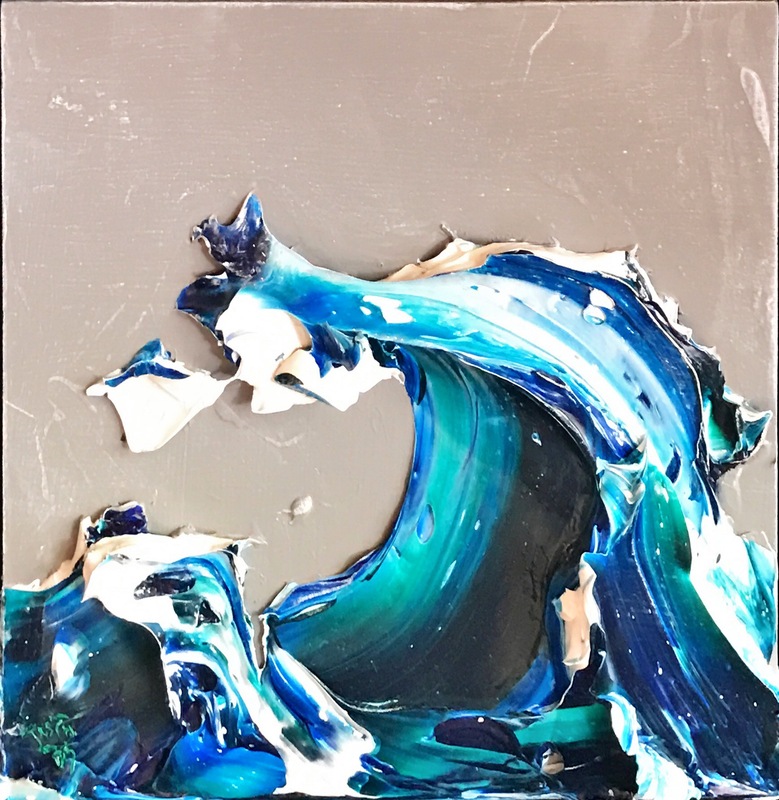 Justin Gaffrey | Wave | Mixed Media Original on Board | 12" X 12"
Justin Gaffrey was born in 1970 in Red Bank, New Jersey. His family moved here to Walton County Florida in 1980 when Justin was 10 years old. In his adult life he worked in furniture design and the culinary arts. Justin eventually went on to open his own restaurant, “Café Sublime,” in Gulf Place where he served as both owner and head chef. In 2001 Justin decided that the long hours and stress of being a restaurateur were no longer sustainable. He decided to sell his business and in the meantime find something to make a living where he could still work with his hands, be creative, make himself happy, and make others happy. Justin remembered the joy he found painting, finishing, and designing furniture. Justin simply got some paint and began painting everyday. His earliest works were very flat and executed in a folk art style reminiscent of Grandma Moses and Rev. Howard Finster. Justin recalls local 30A folk artist Woodie Long as being an influence on his earlier works. Many subjects of Justin’s early work were figurative and influenced by the New Orleans Voo-Doo culture. Free from the responsibilities of owning a restaurant, Justin began traveling. It was during Justin’s travels that he discovered the work of Van Gogh. Van Gogh’s “Starry Night” and “Sunflowers” struck a chord with him. Justin was in awe of Van Gogh’s use of thousands of tiny brush strokes, built in layers, to create the complete composition. Justin could relate this style to his experience as a chef where he used several different herbs, spices, vegetables, and proteins to make a complete and delicious experience. When Justin returned from his travels he applied what he had learned from Van Gogh to his own work. He began his interpretation of Sunflowers using a palette knife. He mixed latex house paint with latex caulk. This allowed Justin to stack many layers of thick paint to create a heavily textured style. He later switched to heavy bodied artists acrylics that he still uses today. Justin has been working as a professional artist since 2001. All of Justin’s work is inspired partially by nature and mostly by human nature and life experience. The underlying motif of Justin’s work is the connection of all things through nature, shared experiences, and the passion to create and learn new things. Justin’s drive to create and learn through his work makes for a very diverse body of creations. Justin’s collectors span from Norway to Australia, Ireland, and all over the United States. His work has been featured in publications such as Southern Living, Florida Digest, and Better Homes & Gardens. Justin has toured all over the country with his work and has had museum and gallery shows in New York, Miami, Nashville, New Orleans, and Richmond, Va.